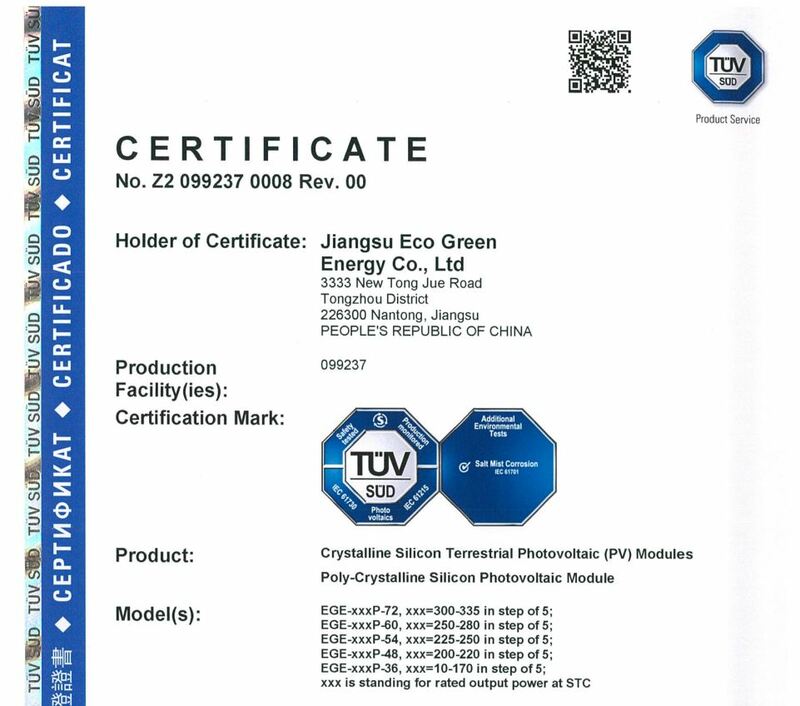 Eco Green Energy is approved by TÜV SÜD , a world leader in testing, inspection and certification for photovoltaic products and systems. 100% of our panels are tested and certified to ensure you the best safety and security standards as well as the highest quality. Living on the coast salt mist is a factor that must be considered in the purchase of any product that has a lifespan of 25 years constantly exposed to all the elements. Salt mist is a corrosive agent that can reduce the output of solar modules that are not proven salt-mist resistant. Salt-laden humidity and rain conditions can adversely affect key module components, including the frames, junction boxes and glass surfaces, thus potentially reducing a module’s performance and lifespan. All range of Eco Green Energy have been certified from 10 to 370 W for both Mono and Poly. Level 6— the most severe testing conditions, involving eight weeks of intensive cyclical, sequential days of corrosive salt spray and damp storage, to simulate a harsh marine environment.